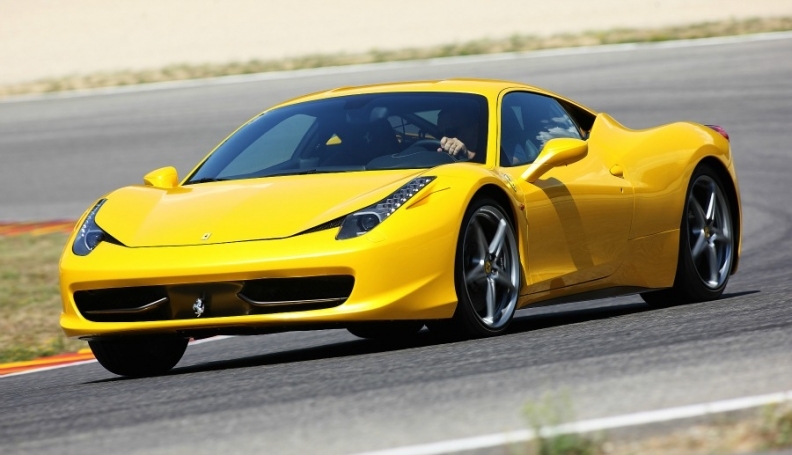 Italian sales of superluxury cars such as the Ferrari 458 Italia are forecast to plunge 47 percent this year. MILAN (Bloomberg) -- The 204,000 euro Ferrari 458 Italia has never been a particularly common sight, even on the autostrade of its native Italy. Today, it's becoming even rarer as austerity measures drive Ferrari owners to export their supercars by the truckload. A crackdown on luxury goods combined with budget cuts that have pushed Italy deeper into its fourth recession since 2001 are souring demand for sporty cars and other symbols of the country's carefree lifestyle. The number of second-hand high-performance cars exported from Italy nearly tripled to 13,633 vehicles in the first five months of 2012, from 4,923 a year earlier, according to auto industry group Unrae. "Italy is one of the strongholds of supercars, and those vehicles are now disappearing from the streets," said Giuliano Noci, associate dean of Milan Polytechnic's business school. "This has a huge symbolic value and shows how deep the crisis is." The exodus reflects weaker overall demand for supercars in the home of Ferrari and Maserati, Fiat Group's most profitable brands. Sales of super-luxury cars in Italy are forecast to plunge 47 percent to 593 vehicles this year from 1,116 in 2008, according to IHS Automotive, which predicts that sales won't return to pre-crisis levels before 2016. The government of Prime Minister Mario Monti is implementing 20 billion euros ($25 billion) in austerity measures as the country struggles with 1.9 trillion euros of debt. The economy has contracted for four straight quarters and unemployment has surged to near a 13-year high as consumer spending and industrial output slump. The downturn prompted Fiat, Italy's biggest manufacturer, to temporarily halt investments in the country. CEO Sergio Marchionne may close another factory after shuttering a plant in Sicily last year. Weaker supercar demand could further sour Fiat relations with Italy and accelerate a shift to stronger markets like the United States and China. Marchionne relies on Fiat's luxury models to offset losses at the group's mass-market brands in Europe, which totaled 345 million euros in the first half. Ferrari and Maserati's combined operating profit was 175 million euros in the period, equivalent to 12.2 percent of sales, beating BMW's 11.6 percent margin. Italy has become a declining source of supercar profits after Monti raised ownership levies on high-performance vehicles as part of his budget reforms. After the changes, owners of the 316,000 euro Lamborghini Aventador pay about 8,400 euros a year in taxes, an increase of 6,600 euros. On top of the extra levies, supercar-owners are being scrutinized in efforts to flush out tax evaders. Since December 2011, Italian authorities have conducted dozens of raids in wealthy areas, including the ski resort Cortina d'Ampezzo and Portofino on the Riviera. The officials stop supercars to check whether their owners declared sufficient income -- and paid enough taxes -- to support their lifestyles. Near Venice last month, financial police arrested a 44-year-old man driving a Ferrari F40 for not having paid 8 million euros in taxes since 2006. In a July sweep in the northern town of Bergamo, police found that the driver of a 200,000 euro Ferrari F131 had evaded 3 million euros in taxes since 2007. "Many Ferrari owners want to get rid of their supercars after the financial police came to one of our events near Rome and checked every driver," said Fabio Barone, who heads the Ferrari owners' club Passione Rossa. One of the members put a Ferrari 458 up for sale for 143,000 euros after buying it for 224,000 euros last year, he said. Barone said he has received calls from dealers in France, Germany and eastern Europe inquiring about vehicles that might be available. Some owners looking to unload their cars are simply listing them on automotive Web sites. Others sell them via Ferrari's pre-owned car program. It's not just Ferraris. Every week about 200 second-hand Porsches leave Italy for other European countries, according to Loris Casadei, head of the Italian operations of the Volkswagen brand. Exports of used Porsche Cayennes more than tripled to 1,134 vehicles in the first five months of 2012. The number of second-hand Ferraris and Maseratis leaving Italy jumped to 424 cars from 142, according to Unrae. "The high-end car market is one of the more resilient to the crisis, and Italy is punishing it. Not a wise decision," said Romano Valente, general manager of Unrae, which represents foreign automakers in Italy. "The luxury tax has created a perverse mechanism." While Ferrari's sales in Italy were hurt by an "anti-rich" political campaign, demand in other markets for cars like the four-seat FF will help the automaker increase sales to more than 7,000 vehicles this year, Chairman Luca Cordero di Montezemolo said at the Geneva auto show in March. Though Montezemolo supports the government's fight against tax evasion, he disagrees with the "demagogic spectacularization" of those efforts, said a Ferrari official. The carmaker sells about 95 percent of its cars outside Italy. Still, the global expansion by Ferrari, Maserati and Lamborghini won't help Italians like those in the Passione Rossa club. In June, more than 40 members were checked by police who were waiting when a ferry carrying them docked at the port of Palermo for a driving event in Sicily. "The situation is dramatic," said the club's president, Barone. The Dolce Vita era "is far behind us."